Prince Shuna leaves his tiny village in search of the golden seeds that might bring better food to his people. He travels far, encountering slaving and saving two girls from it before reaching the land of the god-men and the terrible secret of the grain *and* the slave-trade. at first when i saw the title shuna no tabi i though that it was going to be a boring story, but when i read miyazaki i knew that this is gonna be something. so i read it. basically it would take 30 minutes to 1 hour to finish this manga. it is short and nice. i recommend you to read it, it was amusing. the manga is colored in a nice way, the characters look good. you won't fund too many dialogues there, its just little description about the characters actions. overall, just go and read it, you won't loose anything at all! I never knew that Miyazaki did any mangas--before I read this, his name was synonymous with anime movies such as Princess Mononoke and Spirited Away. I was interested to read this, because I read that it was done before many of his other works. 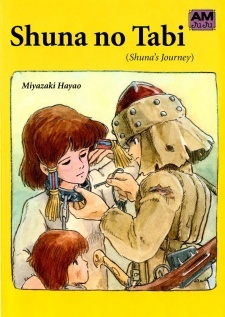 I began to read Shuna no Tabi with the hopes that it would be as wonderful as Miyazaki's later works. I was not disappointed! The art is done in the beautiful, typical Miyazaki style--even fully colored! The art was stunning. I can't imagine how much time he must have put into each panel. The character development is sufficient for a short story of this length, but I wish we had gotten to know the backgrounds of Thea and her sister. You end up loving them, even though you don't know them well. And from the beginning, you are rooting for Shuna on his journey. This manga is very different from others that I have read in that the story is mostly told through the art and some narration. There is very little dialogue. Still, the story flows smoothly and it is easy to understand. The lack of dialogue adds to the fairytale-like feel of it. You will notice that many elements of this manga show up later in his other works. I think Shuna was used as the basis of Ashitaka's (Princess Mononoke) character; the two look almost exactly the same and both ride a reindeer-type creature. "Once upon the time was a tiny kingdom..."
Miyazaki-sensei, what else should I write? This manga is based on old tibetanian tale. It's tipical Miyazaki's work - a beautifull fairytale (this english word is not as good as polish Baśń or german Kunstmärchen) - story about the most importants values and power of friendship. The Miyazaki-fans could find here some similarities to Nausicaa. It's definetly not a work for those who don't like Miyazaki. Hayao Miyazaki fans, especially from watching "Princess Mononoke" and/or watching/reading "Nausicaa of the Valley of the Wind", should check this out. It's a very short and good manga by Miyazaki featuring a lot of familiar designs and storylines that fans will recognize from those stories, if not simply enjoy on their own. This also predates most of his work people are most familiar with, even "Nausicaa". The main plot is similar to "Princess Mononoke" in that the primary protagonist, Prince Shuna, leaves his homeland in search of something - a special kind of wheat that grows in a starving world - and does not return to that homeland within the story. This felt a little off-putting, since this is based on a Tibetan fairy tale where the prince's redemption by returning to his homeland is important. But the story was enjoyable and helped alleviate that weirdness. You might read this with a vague understanding of what's going on most of the time (the strange creatures growing grain and where the slaves go/what happens to them is never explained and is actually a lot darker than usual, even for Miyazaki) but it's a fast read anyway. The art is typical Studio Ghibli, but a lot of the characters and objects used here were used later for designs in "Nausicaa", "Princess Mononoke" and "Tales From Earthsea". Shuna looks a lot like Ashitaka and even owns an elk named Yakkul and Thea looks a lot like Nausicaa. Shuna rescues a prince who looks a lot like one of the old men in Nausicaa. The slave cart Shuna rescues Thea from looks exactly like the one Ged rescues Eren from in "Earthsea". The references for "Earthsea" are there because this book was what Miyazaki wanted to use as a template for that film, and Goro followed through with that when the time came to make the film. The point is that the art is gorgeous, as usual for Studio Ghibli. There are a lot of neat characters in this story. Shuna is much like Ashitaka and it's enjoyable to read his story. His adventure is a long, difficult road. Thea is also a very neat character who shines when Shuna's story wanes for a time. She's a hard worker and a decent person and it was nice that she got to hold protagonist status for a bit. Otherwise this story is pretty much a sausage fest. There's an old woman who bosses Thea around (and even attempts to force her into marriage so that she'll have another worker to boss around) and Thea has a sister and there's a wise woman who councils Shuna near the beginning, but all the royalty is male, the slavers and soldiers are male, most of the townsfolk we see are male and the elders from Shuna's village are male. We get so many great heroines from Miyazaki films that people forget that he tends to fill his casts with men and it's typically they who do the fighting and the politics. He switches things up sometimes - "Porco Rosso", "Spirited Away" and "Princess Mononoke" are prime examples - but this is his early stuff. I liked this story a lot. As far as I am aware, there is no non-Japanese print version and this can be hard to find, but don't give up! Maybe someday they'll reprint this in multiple languages. It's also very enjoyable if you've watched his other films and go back to this and see where a lot of stuff came from, design-wise. At least half of "Tales From Earthsea" in here, along with a good third of "Princess Mononoke" and half of "Nausicaa". Hope you enjoy it too!